Senior citizens are more likely to have some challenges in managing their medications simply because they may have so many of them to take on a routine basis. The older we get, the more likely our bodies are to break down and that could mean an increase in the number of prescriptions being issued by doctors to deal with multiple afflictions. Knowing when to take those medications and how many are required are critical for maintaining the health and overall well-being of seniors. Failing to do either even once can have drastic consequences as it could lead to serious complications where taking the wrong drug at the wrong time could pose a health risk. That’s why medication management is so important. Some prescribed drugs are very powerful and when they interact with one another there could be a real problem. The same goes for taking too little or too much of a medication as the former could render the treatment ineffective and the latter might lead to the development of an addiction to that drug or even a fatal overdose. When it comes to medication and the elderly, it pays to be careful and monitoring their management capabilities can help you avoid any significant problems that might occur down the line. It just makes good sense to play it safe at all times and in order to help your senior citizen stay healthy, here are four medication management tips from your friends at Seniors Helping Seniors. There could be any number of reasons why seniors may have trouble managing their medication intake. 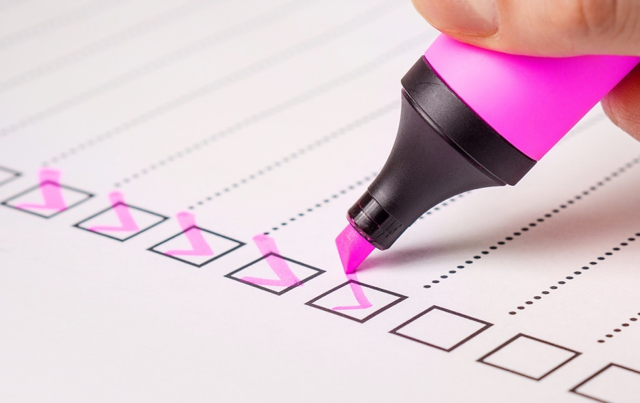 Some of the most common issues are related to the sheer number of medications that are part of a senior’s weekly prescription routine and the times at which they are expected to take them. With so many to remember it can get somewhat daunting to keep everything properly organized. 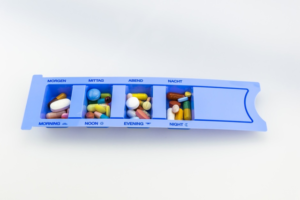 Another barrier to successful medication management is the complicated names of the medications themselves. Let’s face it, the drug companies are just giving their products monikers that are harder to pronounce and too many of them are beginning to sound similar to one another. In addition, the labels on common prescription bottles can be tough to read as the typeface on them is only getting smaller due to all of the information that needs to be included. The language of the label may also pose a challenge as some seniors may not be able to read or speak English. Let’s avoid these problems entirely by developing smart medication management. These four solutions will go a long way in helping your senior take their medicines with success. When there are so many medications to remember, good management can be much tougher to accomplish when all of those medications are scattered to the four corners of the home. That’s why it’s a good idea to gather them all in one place in order to get a better picture of everything that needs to be taken, including over the counter medicines and vitamins and supplements. Some of these things can have substantial interaction problems with medications that are prescribed by a doctor. 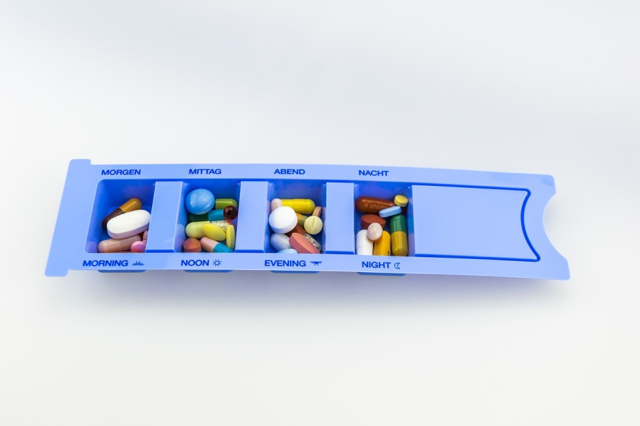 So put everything in one place to ensure that every medication is taken when need be. Whether it all goes into a medicine cabinet or some kind of storage bin is up to you and your older adult, but whichever method will be most effective should be implemented. Developing a timetable and a routine for taking medications is also a smart method towards better medication management. Getting into a habit of taking certain medicines at certain times of the day will help your senior remember when they need to take their prescriptions and get them to do so more accurately and faithfully. All of those medications that were gathered together should also be logged accurately and often so that only valid prescriptions are taken and any outdated or expired medicines are discarded. This will also help you stay on track for knowing when those medications need to be refilled so your senior doesn’t run out and miss a dose. Finally, you must always be sure that the medication instructions that have been included with a prescription are clear and concise. If the dosing instructions are confusing, it can be tougher to make sure those medications are taken. So review all the prescriptions with your senior to ensure that he or she knows what to take, how much to take, and when. That way you can rest assured their medications will be taken faithfully. No Replies to "4 Medication Management Tips For Seniors"